This is the easiest thing to make. It’s perfect for the BBQ as the statchcock doesn’t take an eternity to cook. It’s pretty spectacular looking too. 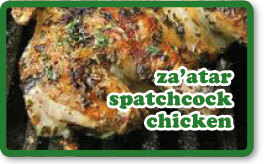 If you don’t manage to hunt out za’atar from your supermarket, then try a middle easter specialist. They’ll be sure to have it. You can buy chickens already spatchcocked (essentially backbone removed, flatened out and skewered to keep flat. It’s easy to do yourself. Just cut with scissors, each side of the back bone to remove it, then turn over and flatten out with your hands. Using 2 skewers, pierce diagonally through the thighs up through the wings on each side to form a cross. That’s it! To make the marinade, simply comnine all the ingredients and rub it all over the chicken. Leave for an hour or so, then grill on a hot BBQ until the chicken is cooked. The skin should be charred and the flesh inside lovely and juicy. Serve with salad bread with some yoghurt & mint dressing sauce.